Our iron is forged in the same way blacksmiths in the 18th century forged, with coal and hard work. The beauty of the smith's hand work is allowed to shine through the finish, which is an original 18th century finish: linseed oil and wax. If your iron is being installed inside your home, polish it with furniture polish once a year or when it looks dry. If you have pintle hinges, inside or out, lubricate with Vaseline if they get noisy or hard to use. If your iron will be used outside, please read on. Exterior iron will rust without care and maintenance. The traditional method of preserving iron is to rub it with linseed oil every 6 months or so. Usually this only needs to be done during the first 3 or 4 years. The build-up protects over the long term. Some people prefer bowling alley wax or butcher's wax. Both work well. The iron will develop a lovely patina from the wax or oil, combined with use. To prevent iron from 'bleeding' in areas where exposed to driving wind and rain, paint the surface of the iron that will contact the wood. Rustoleum or a rust inhibiting black paint works well. Some people prefer to powder coat or paint all surfaces of the iron to eliminate the maintenance. When you do that, you will minimize some of the beautiful surface texture on your hand forged iron, but it is an equally period approach. Much antique iron was painted. 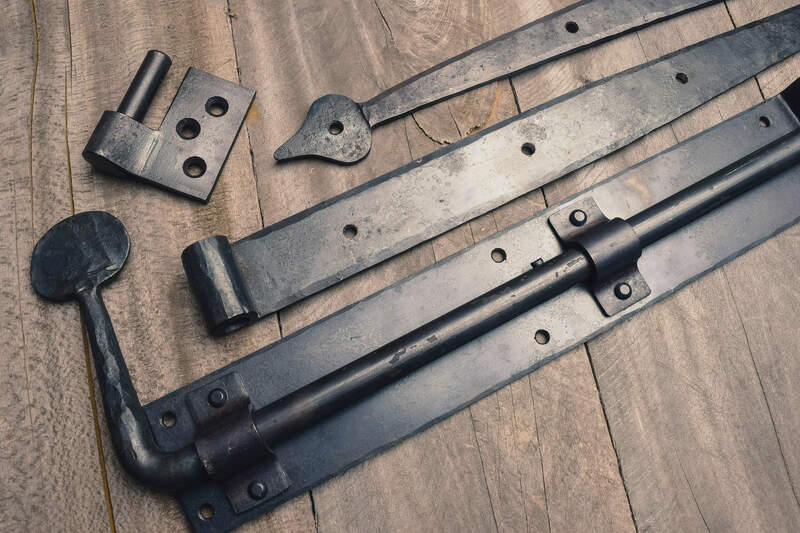 If you decide to paint or powder coat your iron hardware, and you would like to enhance the coating’s adherence ability—order the iron without the linseed or wax finish applied. The product will arrive in a plain, gray finish and will have no contaminants to interfere with the coating’s ability to adhere. Untreated iron is not a stock item, and can take from 3-8 weeks. Pre-drill all holes before driving screws. The importance of this cannot be overstated. Additionally, when driving the screws, drive gently. If you use a mechanical driver, you should hand drive once you are close to the iron surface. Many times I have seen iron in perfect shape except where someone drove the screws in so deeply and with such power than they gouged the iron that surrounded them. This is not necessary and causes rusting wherever the iron’s finish was damaged. Use the screws we provide. They are coated with special coatings to assist in rust prevention. If the screws we have provided are not long enough, or are too long, call us up at 800-754-9127. We will be happy to send others out in the length you prefer, if we have them. We stock a wide selection of screws. Always wax or oil the hardware immediately after it has been installed. If you ever have any questions about your iron, please don’t hesitate to contact us. Your hand forged iron should last a lifetime.